After last week it's safe to say we are officially taking on winter, full force ahead. Anything above 0 is now considered a heat wave, and it's just normal to be parading around with an extra layer on at all times. With this brutal cold of the Midwest comes the onset of extreme dry weather. Up until last year I've always struggled with how to care for my extremely dry skin, especially during this extra cold months. It seemed that no matter what I tried I always ended up with those little white dry flakes on my forehead and cheeks. Last winter I feel like I finally discovered the best formula to beat those pesky dry flakes, and they have been gone since! The first step in keeping a healthy winter glow is hydration. It makes all the difference in the world. I keep a humidifier running in my bedroom as much as I can, aka as long as I remember to fill it it's running. Besides the humidifier, be sure to drink plenty of water. That is usually a challenge for me as it is, but even more so this time of year when it's cold out. I've learned the more water bottles I keep around, the better. And this time of year I keep them stocked with room temperature water so it's not such a shock to the system. Drink, drink, drink, whenever you can. I can tell just by looking in the mirror if I haven't had enough water for a few days, my skin starts to look dull and tired. The second thing, I recommend using something to exfoliate about 2 times a week. I love Lush's Ocean Salt, the salt is coarse enough to wash away the dead skin, but it's not drying at all due to the avocado and coconut that are in it. The last step is all about the daily moisturizing routine. This is the combination that is currently working the best for me. I start with spraying my face with a moisturizing toner. I like to stick away from anything that is alcohol based, since those are super drying to the skin. I love this one I'm currently using by Andalou Naturals because it contains aloe vera, a super fruit complex, and vitamin C. Then I follow up with using a little of Dermalogica's Skin Hydrating Booster on my typical dry spots, the middle of my forehead, around my nose, and my chin. And finally I finish up with a good moisturizer, like Andalou Naturals Renewal Cream. I like that it's a thicker cream, but it soaks right it without leaving any sort of heavy or greasy feel leaving a perfect canvas to apply my makeup to. What are your tricks to healthy skin this time of year? Andalou products always smell amazing! I just started using the Dermalogicia skin booster and can't wait to see how it works! I just told Dustin last night I am so over dry skin and chapped lips, warm weather can't get here fast enough! Lush Rub Rub Rub is a fave of mine, I've not tried Ocean salt! I am so excited to see natural products in your post! I don't see them recommended very often, so thank you for the product ideas. Great products! I run my Crane all the time because the air is so dry and this last week, as you know was completely awful! Ready for summer for sure!! Thank you for this! Pinning! Such great recommendations! I definitely need to up my water intake - it's so hard for me during the winter because since I'm basically always freezing, I just don't have the urge to down a glass of water. My skin, however, is showing the results of that unfortunately. That Lush scrub sounds fabulous, too! The nice thing with the Dermalogicia skin booster is a little goes a long way, I have a feeling this little bottle will last a long time! I haven't tried the Rub Rub Rub yet, I'll have to check it out next time I'm in the store, I love their stuff! I try to use as many natural products I can, my goal is to find natural and effective products because it's crazy how many things are in the others that you have no idea about! So ready! It's funny, if it happens in December I can stand it, once January hits, I'm done! I hear you, I am always freezing this time of year! I try to drink more tea, and sometimes just plain hot water to help my water intake when the last thing I want is a cold glass of water. 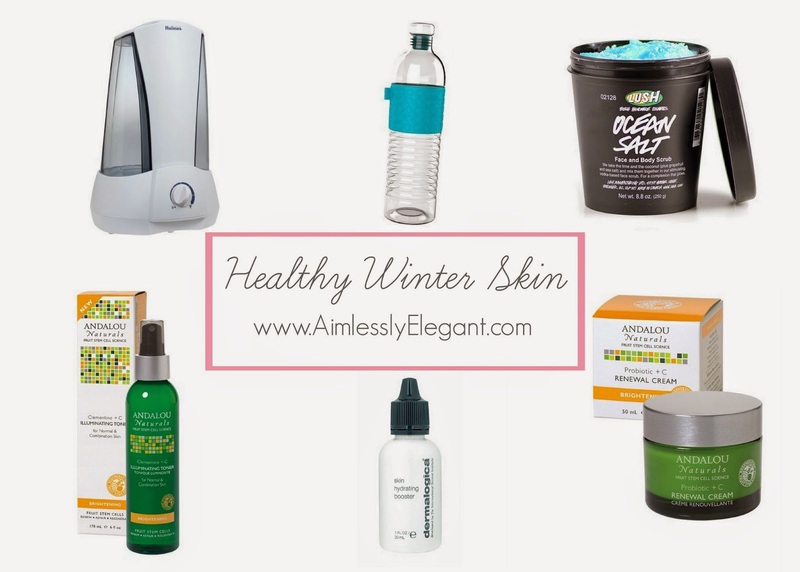 Skin care is so difficult in the winter! I just got a new toner from Burts Bees and am hoping it's going to be less drying than my usual! Great tips! Curious how that toner works out. If not, the one I mentioned in the post is great- not drying one bit! You can find the Andalou Naturals at Whole Foods, and my local health food store even sells it.